Boy have we become spoiled in the digital age. I’m not sure when this will be posted, but at the time of writing this, I have a Holga 120N and a bunch of film at my desk. I bought a couple rolls each of colour and black and white film in ISO speeds of 160 and 400. I have no idea what to load into my Holga! With my digital camera I can change ISO on the fly. Dark outside? Increase the ISO. Want a slower shutter speed when it’s bright outside? Decrease the ISO. But with film I’m stuck for 12 frames with whatever I put in there! Of course, this dilemma is exaggerated by the Holga. With a regular film camera, I can adjust the shutter speed and aperture to compensate for the film speed. Really, it becomes more a matter of how much grain I want in my photos. So I can choose 160 and only take photos outside or I can choose 400 and only take photos inside or near dusk or dawn. The other thing that has been on my mind for days now is wondering what is worth the cost of capturing on film? 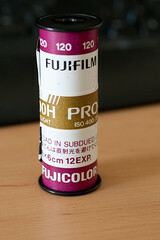 I guess part of the answer for that will have to wait until I see the results of 120 film. Right now it’s looking like it’ll be about $12 to process and receive contact prints at a local shop. So that’s $1 a photo. That’s a lot of money considering the best quality prints I can get for my digital photos cost about $0.30 a photo. Now, the photos ARE supposed to be much higher fidelity, but it’s still a matter of economics. Interestingly, as I’ve been scanning my old photo albums (unfortunately from the prints because I don’t have a way to read/scan APS film), I came to debunk the myth that digital has fundamentally changed my photography. In my head, I had this image of my photography as mostly being event-based (eg birthday party photos) and posed photography. After all, I had to pay for the film and developing costs from my allowance and later from my salary. So how could I afford to take candid portraits or other such shots? Revisiting my photo albums, I discovered that I was actually more of a photo documentary or photo journalist recording my entire life with photographs. And, as I gained access to more money, my photography increased in volume. I can also fire off more shots. For most of the events I recorded on film, I would have taken many more shots if I had digital. Is this good or bad? It’s nearly at the level of aflame war whenever someone brings it up on the net. I think the proper answer is that it depends upon the situation. First of all, I think it facilitates learning to see things from different angles if you can approach a subject and shoot from every angle without having to worry about developing the crappy ones. When you get home and load them onto your computer you can see which angles worked and try to analyze why. I would expect this use case would have people eventually taking fewer photos as they learn which angles work best for which subjects. Second, with event photography such as a football game or baseball game, you don’t know what the awesome shot is until the game is over. So you need to be able to capture all the great shots so you can later evaluate which is the best one. Third, someone covering a rally or political protest would definitely want the benefit of digital to be able to get as many signs and other photos because you don’t know if you’ve got the front page photo until you’re done. Finally, when documenting something taking place over time, it is useful to be able to take many shots. For example, if someone is building a sand castle, it may be interesting to see it evolve over time rather than just taking a final shot when it’s done. So, without knowing how the photos will turn out, what do I take photos of? As of now, I think I will use film to capture some of the same things I would with digital, but taking a more considered approach. Where I might be able to take a half dozen photos with my digital camera, I’ll have to find that one special moment to click my film camera’s shutter. After all, even if I wanted to take a bunch of photos in quick succession, I still need to wind the film between shots and that takes time. So it is naturally a slower progression. Something about this film also calls out to me for urban landscapes and street photography, so I’ll definitely use it next time I go to NYC. I’m also curious in some Holga B&W shots of famous Washington DC landmarks. I think there can be some pretty neat aesthetics — at least in my head and based upon what I’ve seen Holgas do. I also definitely want to take the cameras to photograph the Coney Island boardwalk. There, in addition to being a photogenic backdrop, there’s definitely a link to early photography with photographers peddling 120 film (and other older formats) to people at the beach back before everyone had cameras in everything — like phones! After writing all this, I have a better sense of what I want to photograph, but I’m no closer to deciding what film to load into my Holga. (After going to work….) I decided to throw in some colour ISO 400 film because I have five rolls of that, so it’s not as though putting it into my Holga will keep it away from the Yashica that should be arriving soon. Plus, I think I want to use one of the B/W ISO 400 rolls in a wedding I’m going to soon that will mostly take place indoors.